This meticulously made sideboard is a superb example of British midcentury furniture design. Though less famous than Scandinavian Modern, midcentury design’s British variant is very well-regarded for its iconoclasm and structural integrity. It also made more extensive use of local materials (such as Oak) in lieu of exotics such as teak and rosewood. According to its inspection stamp (on the back) it was made on May 28, 1969. 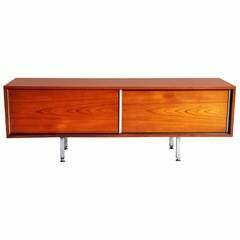 Italian Mid-Century Modern sideboard in mahogany with glazed craquellé ceramic door handles. A 1960s Mid-Century Modern lacquered sideboard painted in a black and brown finish. The sideboard has useful drawers and doors for proper storage. 19th century English pine sideboard with a two board top, following down to two drawers in the front and panelled sides. The piece is supported on simple legs. Mid-Century Modern Scovby Møbelfabrik rosewood sideboard. This item is in original condition, can be sold as it is or fully restored.